Every child wants to know that Santa has put them on the nice list. With our personalised certificate they can be reassured that they have been good that year. 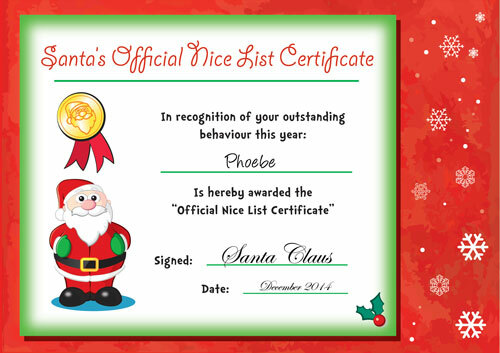 We have designed our very own Nice List Certificate which can be personalised with the child's name and signed by Santa Claus himself. The certificate is A4 in size and folded when posted. The certificate is a great addition to any santa letter because once received you can imagine it going straight up onto the family notice board or put on the fridge. Do you have further questions or queries? Call us on 01934 743276 or Contact Us!